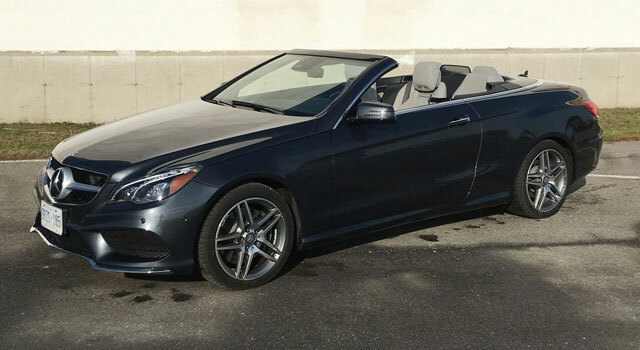 I managed to get a booking on this Mercedes E400 Cabriolet on the last week it was available to press testing before being returned. At the end of November, there is often snow in the forecast but the week ahead looked perfect so I was game to give it a go. The current model E-Class debuted back in 2009 and received a mid-cycle facelift for the 2013 model year. This will be the fourth and final year before a brand new E-Class is brought to market. 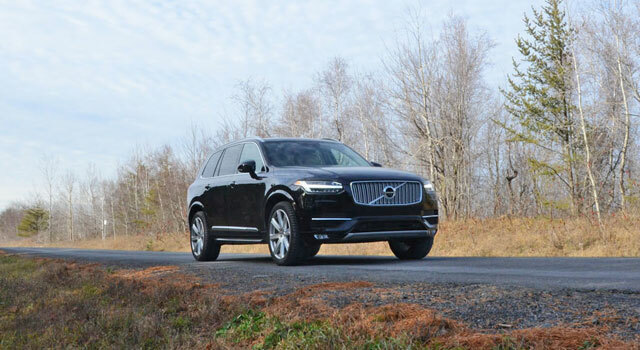 Now, most people might hold off on buying the last year of a vehicle body style because they don’t want to be stuck with the “older model” less than 12 months after a big purchase. I think the current design of the E-Class is so modern that it mitigates this scenario to the extent possible. You also have the added benefit of the manufacturer having worked out any bugs with the design. First-year generation models often have problems that get ironed out as the years go on. Big, aggressive-looking headlights and a large grille give the E-Class an imposing presence from the front. 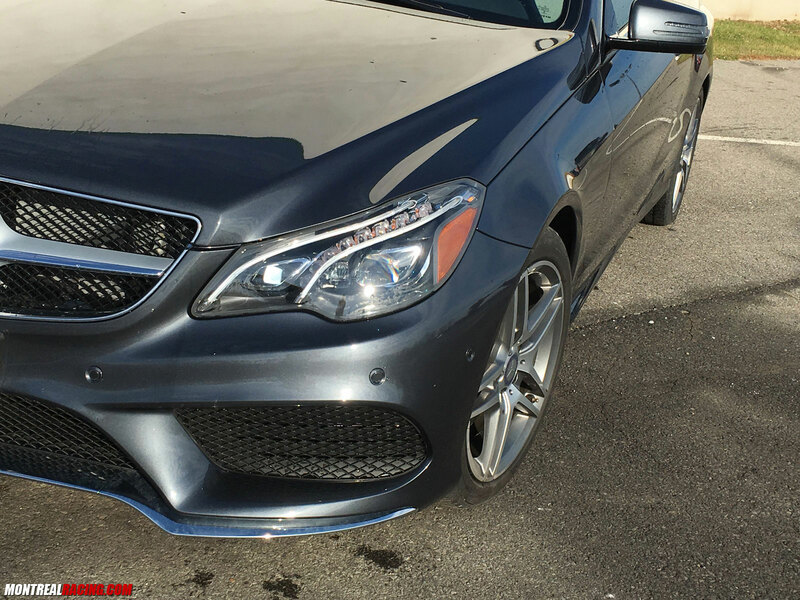 The long, swooping dual LED daytime running lights are among the largest on the market and make this car instantly identifiable as a Benz. The rear is a bit tamer and remains much the same as it was in 2009 except for new LED tail lamps. 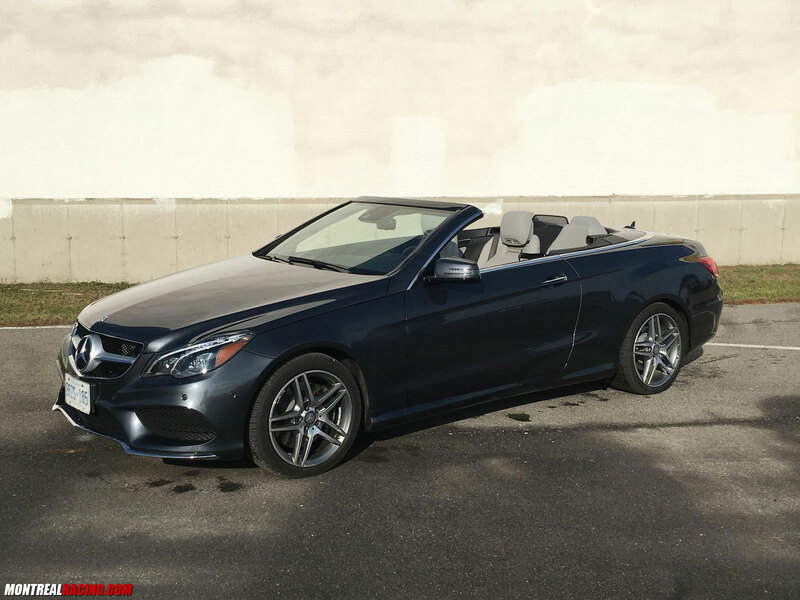 18” AMG-style rims wrapped in Michelin rubber adorn the four corners for a decisively sporty look to this convertible. 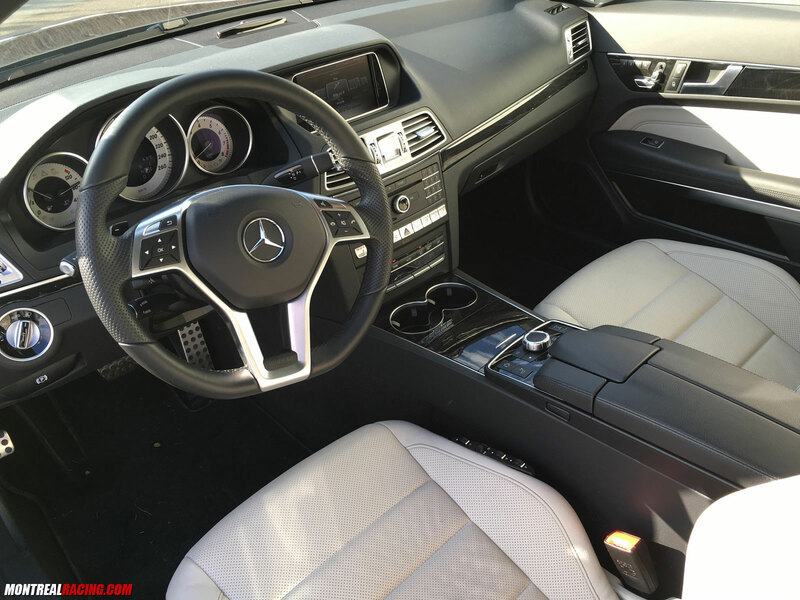 Sitting inside the vehicle you are surrounded by Mercedes’ world-class luxury. All the materials are top notch and the finishing is beyond reproach. The brand takes a slightly different ergonomic approach to some things including seat positioning controls and the gear-shift lever. The gear shifting in particular takes some getting used to as the majority of brands use a lever on the center console. I must admit, I was often looking to rest my hand somewhere on the console while driving but nothing is there. I ended up just putting both my hands on the wheel which is obviously safer. I secretly wonder if the design is a secret plot by Mercedes to get driver to do just that. It one thing I wish I could change. The driving experience in the Mercedes was among the very best I’ve ever experienced. This is even despite the vehicle being a convertible (which are usually heavier & don’t handle as well) and despite having to drive from Montreal to Mont Tremblant during the first snowfall of the year without winter tires. It could have been a recipe for disaster but the drive turned out to be such an enjoyable experience that it completely changed my perception of the brand. That’s not to say I had a poor opinion of Mercedes prior to this test drive. I would simply describe my prior feelings as neutral. There is a reason that Mercedes is considered among, if not, THE best all-around vehicle in the world and I just found out why. The car had power when I needed it, handling when I wanted it, comfort when I needed in (including a seat with several different lumbar/back adjustments) and just worked well. The steering wheel is the main interface between you and the vehicle so it’s imperative it be well-made. 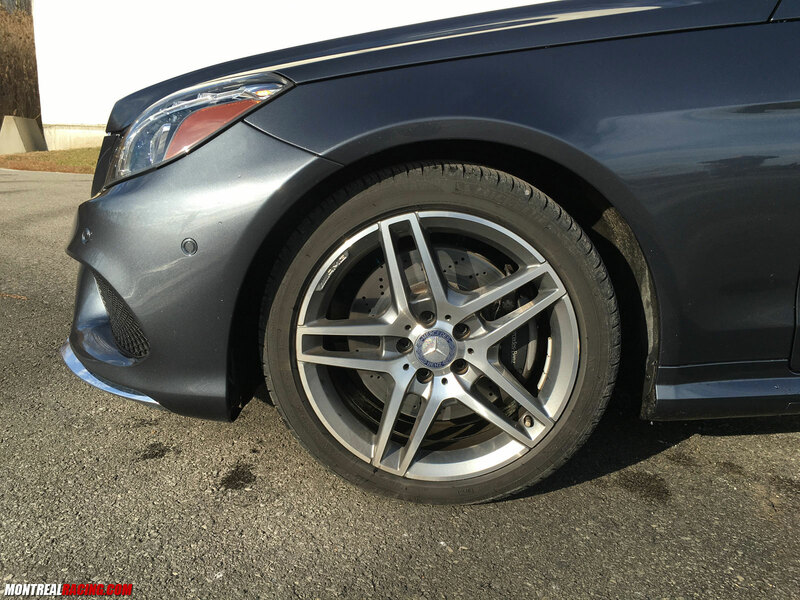 The E400 wheel is so pleasant to grip that I savored every minute with my hands on it just taking in the feeling of everything. The last point about the driving experience I’d like to make is about the sport mode. Many vehicles have “sport modes” but often they are imperceptible. Switch on sport mode in the E400 and the car instantly changes the ride to the point where it could be felt. 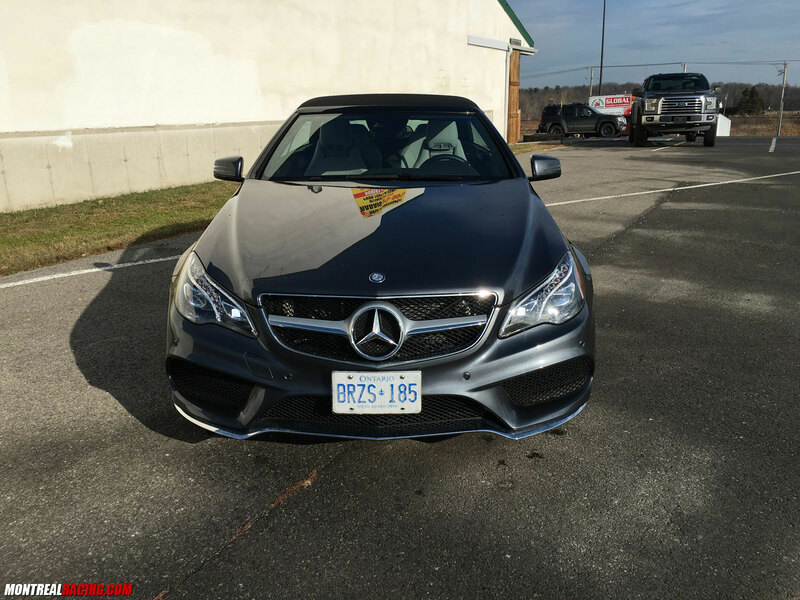 There are enough trims and packages to suit just about any need and with the Premium & Sport packages plus a few other options, my tester came with a sticker price of $78,900. 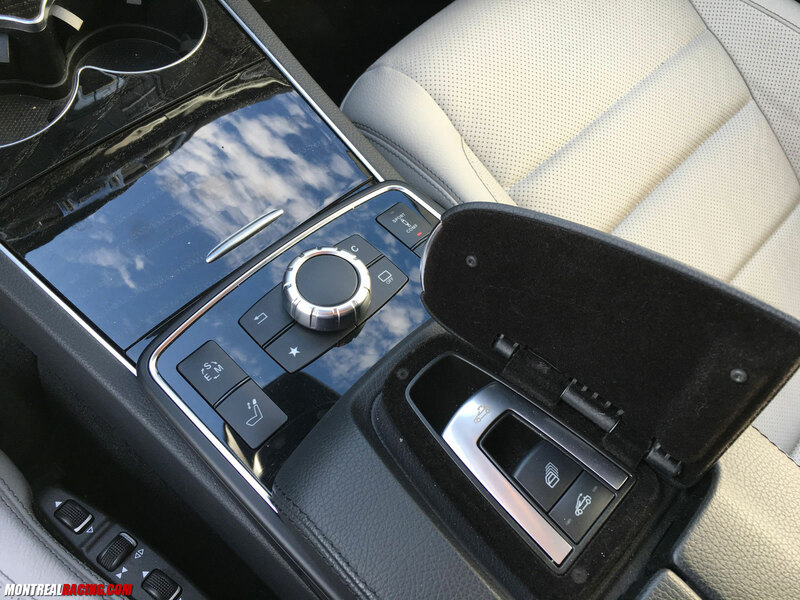 The Premium package contains features such as a rearview camera, power-folding mirrors, heated front seats, COMAND with navigation, voice activated controls, SiriusXM radio and a Harman Kardon sound system. The Sport packages adds the 18″ rims, a sport steering wheel, sport handling and sport braking. Finally, the climate comfort front seats adds (my favorite) the AirScarf neck-warming system for drives in chilly weather with the top down. The top operation controls are located in the center console & the whole operation is completed in about 20 seconds and can be done at speeds of up to 40 kilometers per hour. Mercedes’ AIRCAP system uses a draft-stop behind the rear seats to reduce wind for the occupants during top-down operation. In 5 degree weather I drove with the top down and was more than comfortable. 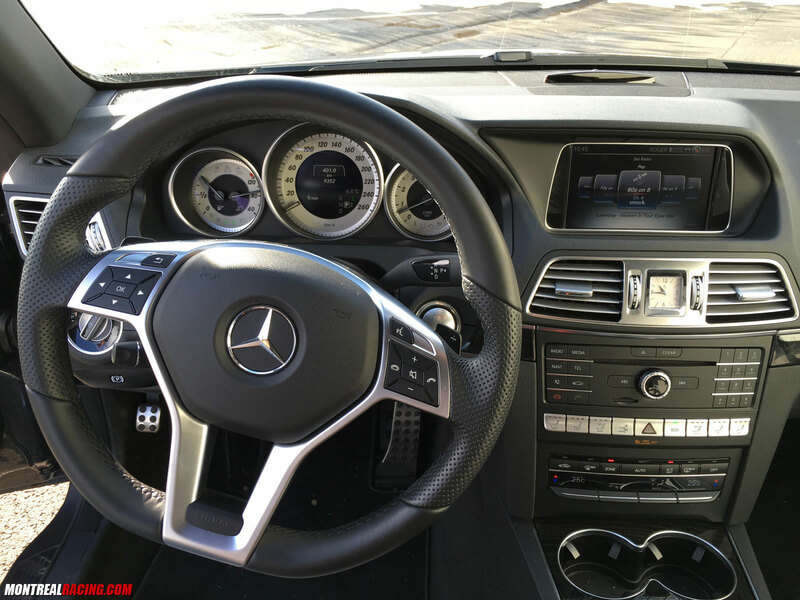 The COMMAND infotainment interface features control by voice commands, steering wheel or knob located on the console. There is an option “mbrace” system which can give traffic updates, local weather, stolen vehicle tracking, collision warning, internet browsing, Google Maps with Street View, Facebook access and even news. With the proper app on your phone you can even lock/unlock the vehicle. I’ll admit I didn’t find the system the easiest to use. 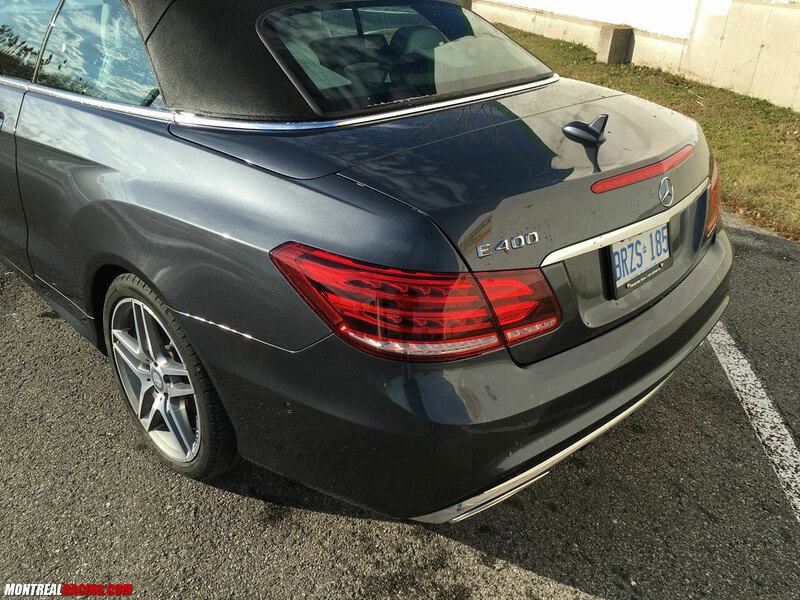 There is no shortage of safety features on the E-Class Cabriolet including the standard traction and stability control, lane-keep assist, collision avoidance, blind spot monitoring and Pre-Safe Brake which applies 100% of braking power right before a collision. The ATTENTION ASSIST system can even detect driver fatigue by learning the profile of the driver. 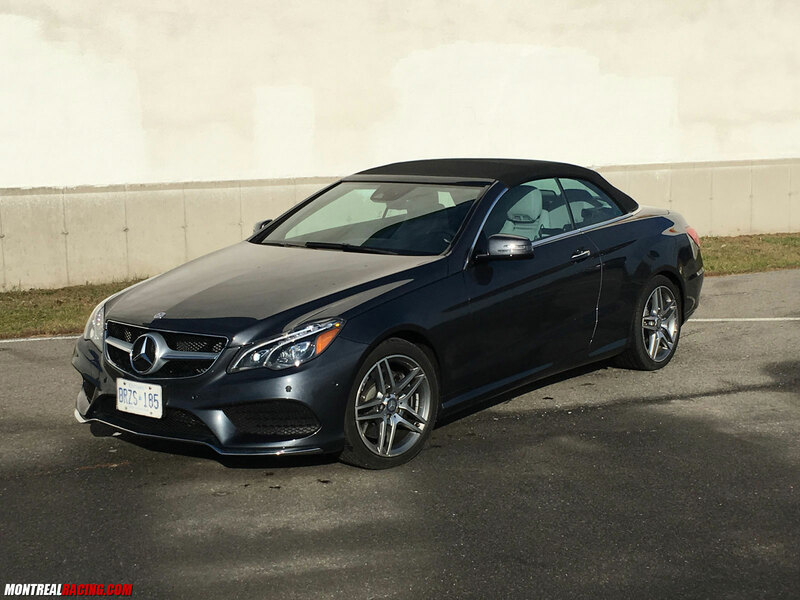 Starting at $62,250, the E-Class Cabriolet is somewhat of an oddball when it comes to the competition. 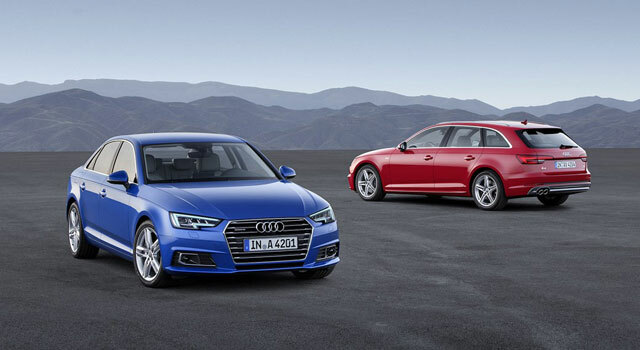 It resembles more the BMW 4-Series and Audi A5 Cabriolets despite the E-class being one echelon higher in the lineup from the corresponding C-Class. It’s somewhat of an intermediate between the 4-Series and 6-Series Cabriolets. 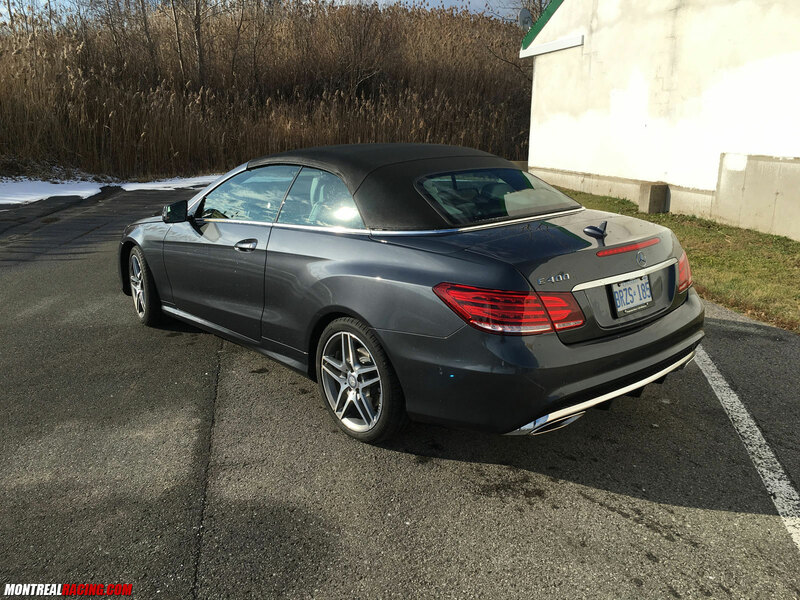 No matter where it find itself slotted in the lineup, it’s a must-drive more anyone considering a luxury convertible.